Every other Friday, I'm going to be sharing snapshots that I have taken in and around Mobile. Not only do I want to share with you guys this place, but it will help me to get out and explore. I love the idea of "snapshots", because sometimes they are quick and can be hurried, but always capture a memory. My photos may not always be perfect or frame-worthy, but I hope you enjoy them. I hope you enjoy seeing little glimpses of Mobile and I hope this encourages you to get out, explore your town, and take advantage of all your place may offer. This is #SnapshotsOfMobile. Enjoy! Towards the end of 2014, my roommate and I were exploring downtown Mobile. We had heard people talk about this Before I Die wall, but wasn't sure of where it was. Well, we wandered down one of the main streets of downtown and found it! Before I Die was created by Candy Chang in 2011 in New Orleans, Louisiana. She created the wall after losing a loved one and found herself falling into depression. I love what it says on her website about the creation of the wall. There are now over 500 Before I Die walls around the world in over 70 different countries! Learn more about the Before I Die Wall and it's creation here. Chang created this experiment on an abandoned house in her neighborhood to create an anonymous place to help restore perspective and share intimately with her neighbors while remaining an introvert. Have you ever come across a Before I Die wall in your area? If you could write on the wall, what is one thing that you would write? Want to see more snapshots? click here to see all in the series. Sponsoring a child has been something that I have wanted to do for awhile now. I've always gotten close to the decision and then walked away from it, for a myriad of reasons. I either couldn't afford it with only my part time jobs, I wasn't sure who to sponsor with, or I wasn't sure who God was leading me to sponsor. Boy? Girl? Young child? Young teenager? Africa? India? Or some country I have never heard of? All I knew was that one day, I would be able to sponsor a child and I couldn't wait for the day. I've known about Compassion International for awhile now. They are a big supporter and leader in the sponsoring and advocating for children. Shortly after I started this blog, Polished Arrow, I became a Compassion Blogger. It's wonderful being able to join in with other bloggers and advocate for the sponsorship of children around the world. Yet, even when I became a Compassion blogger, I still felt like I couldn't write and blog properly for the support and encouragement of sponsorship, because I wasn't yet a sponsor myself. Well, that all changed last November, when the wait was finally over. Over the past year or so, I've been hearing and seeing the country of Bangladesh pop up in various places. Whether a small whisper in my head, something in the news, a t-shirt tag. The more I started thinking about it, I just couldn't get Bangladesh out of my mind. Then, last year when I started my full-time job, I decided that now was the time to start sponsoring. I couldn't wait any longer and started searching through Compassion's website every night, pouring over all the children. At first, I loved the idea of sponsoring a child that had the same birthday as mine. How special and incredible would that be to share that in common with a little one across the world. Then, I started searching by name. Then gender. Then age. There were so many! "Lord, just let me have them all!" I thought. When I felt like the Lord had shown me the child, I would click on another page and then I was certain that she was the one. No, wait, he is the one. Then, I searched among the country of Bangladesh. Narrowed it down to the girls. And there she was. The one that I felt the Lord was calling me toward. And I excitedly clicked on her picture, wanting to know more. Meet Sheuly. My new thirteen year old, friend and sister, from Bangladesh. Once I clicked on Sheuly's name and dedicated to sponsoring her, I was so excited and thankful for this opportunity. After I entered all my information, I went back through Compassion's website to search for her and she was gone! It was real! I was her sponsor! That night I think I read everything on Compassion's website about Bangladesh and the area that Sheuly lives in. And every time I got an e-mail from Compassion, I opened it wondering if it would contain just a little bit more about Sheuly and her family. When I got my information packet in the mail, I read it all, cover to cover, and just stared at her picture. I posted her picture on our prayer door in our apartment, where I see her face every day. And I put another on my nightstand. Then, I waited in anticipation for that first letter. One day, when I got home from work, there waiting for me in the mail, was an envelope from Compassion. I rushed up my tiny staircase, plopped down on my couch, and tore open the envelope. Inside was a sheet of paper filled with beautifully written Bengali words and sweet hand-drawn pictures. I read that letter over and over that night, eager to get to know her more. I'm so thankful for this opportunity to sponsor Sheuly. To get to know her and her family more. I'm thankful that the Lord showed her to me and that she is the one whom God wants me to pray for daily. I'm incredibly thankful for the pieces of paper that will be exchanged between the two of us. I'm excited to watch Sheuly grow and to see what this sponsorship brings for the two of us. Have you ever thought about sponsoring a child through Compassion? I highly encourage you to go check out their website and see which child the Lord may be placing in your life. Do any of you already sponsor a child? What is your favorite thing about sponsoring? Dated | Yes, you read that right. Never have I ever been on a date (that I knew was a date) or actually dated someone. Although, for most of my life, I've been okay with this. If you would have asked me a couple years ago if I wanted to date, get married, etc. I probably would have told you, "naw." However, now? Bring it on, Lord. Bring it on. I feel like I'm actually in a place where I could do this adventure...even though I would have no clue what I was doing. But, does anyone really? Been out of the country | This is something that I really hope to change. And hopefully before a honeymoon if that ever comes. I've always wanted to travel to London to photograph it in black and white. I've always wanted to go to Botswana for some reason. And I would like to see Haiti and Bangladesh. Actually finished a journal | Whether it be an actual journal or a sketchbook. I've never finished either. I always have the best intention, but I never follow through. Either I don't like where that journal is heading and I start fresh with a new one or I find a new pretty one and immediately want to start writing/doodling in it! So, I have many a journal with lots of entries, just no last page filled in. Wanted to go on a cruise | Yes, I have no desire or interest in going on a cruise. The idea has just never appealed to me, plus the thought of a boat that big...out in the middle of the ocean...no thanks. I do like being on boats, sailing, kayaking, but all of those include me still being able to see the shore. Comfort people, comfort. Also, if I was going on a cruise just for the destination, I would rather fly there in half the time and enjoy more time on the land in said destination. Plus, I like flying. What are some things that you have never done? Are you hoping to change any of those in 2015? 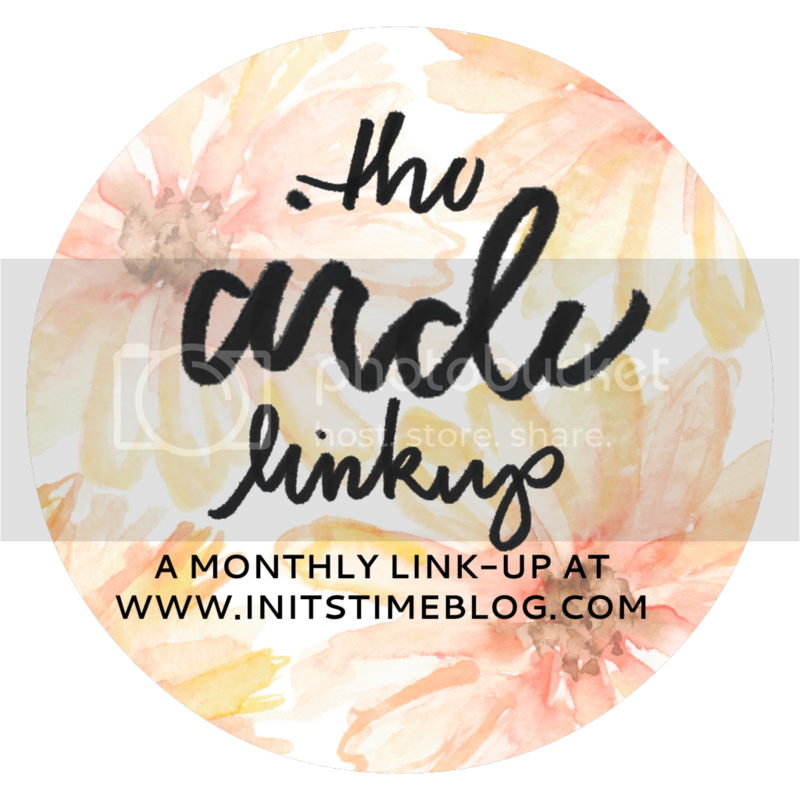 Linking up with Kiki and Amanda for this month's The Circle! I'm a fan of goals. Short term, long term, big and little. I will even write something on my to-do list that I've already done just to mark it off. Yes, I'm that person. So, I've seen a lot of people do goal posts and I thought I would join in. There are things that I hope to do this year and I actually want to do them. Small, little, short term, long term. So, this year, I'll be joining in and posting my goals at the beginning of the month and then recapping the next month to see how well I followed through. Feel free to keep me accountable on these things! Read two books | I actually have a goal to read 24 books this year, that equals out to two a month. So, this goal will be seen every month and hopefully I stick with it. 24 books may not seem like a lot to some, but I have a habit of getting on a reading frenzy for awhile and then just not reading anymore! Hopefully this will be a good pace for me this year. Check out the BOOKSHELF to see which two I'm reading now and all the books I chose for this year! Make and try two new recipes | This is another one that I'm hoping is seen every month. I got several new kitchen appliances for Christmas, as well as some great cookbooks. Now is the time to put it all to use! Create a Facebook page for Polished Arrow | I've thought about creating a Facebook page for my blog for awhile now. Facebook is about the only social media platform that my blog doesn't have a presence on. I like the idea of having a page where everyone can see post updates and news easily. Branching out to Facebook also means that more of my friends and family will probably find my blog. Which is a thing that both excites and terrifies me. What are your thoughts? Do you have a Facebook page for your blog? Draw...something | I used to love to draw, especially in high school. I've always had tons of crayons, colored pencils, and sketchbooks. But, like my journals, sometimes my sketchbooks don't get filled up completely before moving on to a new one. One of my aunts gave me a ton of new art supplies for Christmas. And I'm so excited to open it all up and just draw...something! I've even found a drawing class in my area that I'm thinking about taking in the Spring. In the meantime, I might look around for a fun drawing/art challenge. Do you know of any? Write at least two letters and mail them | I love writing and sending letters to people, just as much as I love getting something in the mail! I have a few pen-pals (some of them are you guys!) that are just fantastic. And their letters always come at the best time. The Lord knows exactly when we need encouragement and sometimes He gives me that through a letter. This month I want to write at least (possibly more) two letters and put those stamps to good use and hopefully send someone some encouragement and happiness right when it is needed. What are some of your goals for 2015? Welcome to 2015 everyone and another edition of #SnapshotsOfMobile! This is one of my favorite shots so far in this series! I got this shot the day of the partial solar eclipse, that we ended up not being able to see thanks to those dark clouds on the horizon. However, we we first walked up on the pier, I looked through the clouds (with no eye protection, which I know is no no, but my eyes are already messed up. ha!) and I could see some of the eclipse that had already happened. I wish I could have seen the whole thing in its entirety, but look at that sunset. I definitely was not disappointed after that. Also, I really wish I could have been one of those kayakers that day. It was a perfect evening for a paddle around the Bay. Have you ever witnessed a solar eclipse or a lunar eclipse? Planning | Oh, so many things! Planning on getting more involved in a local church I've been visiting. Planning on possibly creating a Facebook page for Polished Arrow. Planning on getting back on a better sleep schedule. Planning posts...in advance. Planner in my fun and fancy planner that I picked up at Target the other day. Planning on making 2015 a better year. Hoping | That I can use my new crock-pot soon! And my new bake-ware! And my new French Press! And my new, fresh surplus of art supplies! Christmas was good, y'all. Baking | I sadly haven't baked in awhile, but I'm always up for a tasty treat! One of the gifts my mother gave me at Christmas was a recipe tin FULL of nothing but cupcake recipes. It contains every cupcake I think ever thought about it. I can't wait to choose one and bake. In that new bake-ware that I have already mentioned once. ha! Wearing | My new Aztec print cardigan that I also received at Christmas. I'm in love with it. Seen here in this awkward photo. Resolving | On making this year a better one. To live better, do better, and be better. In all aspects of life, everywhere I go. For myself, those around me, and mostly for God and His glory. Linking up with Jenna and Anne! While driving down the back roads of Mississippi on my way home to Alabama from Tennessee (there was lots of travel time during Christmas for me), I started thinking about what 2015 was going to be like. I started wondering what the new year would bring, where I would go, and what I would experience. I thought about where the Lord was going to lead me and what all He was going to show me in the new year. Then, I started thinking about making some new years resolutions. Which, I've made in the past, and have quickly forgotten about. I love making goals, short and long term. Yet, when it comes to resolutions, something always gets in the way. When I really started blogging again a little over a year ago, I discovered the trend of choosing one word. Instead of setting resolutions, or in addition to, you choose a word to focus on and build your year around. This definitely appeals to me more. Last year, the word that I chose was "wait." I bounced around a couple different words until I finally landed on wait. And 2014 was definitely a year of waiting for me. There were times I was able to wait patiently and many more times where I was restless, frustrated, and angry. I waited to feel at home again in my parent's house. I waited to find a place in my old church. I waited to find a full-time job. And after what seemed like a lifetime, the Lord began revealing himself and began answering prayers. It may have seemed like a lifetime, but it was only a little over a year. Which, as I'm getting older, I realize is not as long as it seems. In 2014, in a year of waiting (and much dreaming, wishing, and praying), the Lord allowed me to feel welcomed back into my old church family and serve the children there, he hilariously gave me the opportunity to become a barista and enhance my love for coffee (as if that was possible), then, the dream of dreams at that time was answered. He provided me with a full-time job in a new city! Then, made available the most perfect apartment for me and a dear friend! 2014 ended with answered prayers and new prayers being formed. So, going back to those back roads of Mississippi. I was traveling with my parents and we were about an hour from home. Tired, restless, and desperately needing to go to the bathroom, a word popped into my mind. Then, I heard it repeated again and pulled out my phone to make some notes. Within a couple of minutes, I had a whole outline, for the whole year, written out. It came so fast and so easily, I can only believe it came from the Lord himself. 2015 is going to be the year of "better!" I'm going to aim to live better -- physically, emotionally, and spiritually. I'm going to aim to do better -- in my home and locally, nationally, and internationally. I'm going to aim to be better -- for me, for my family and future family, and most importantly for God and his glory. Before the clock even switched over to 2015, I had an excitement and anticipation for the new year like I have never had before. I truly believe great things are in store this year, because my heart is finally, truly open for the Lord to do something great. My first thought in the new year wasn't, "what am I going to do this year?" It was, "what is the Lord going to do this year?" I'm excited to see what all the Lord is going to reveal in this year of "better!" What does your 2015 look like? Do you have any resolutions or a word you are focusing on this year? Where do you see the Lord leading you? Leave your comments and links down below!